Goalkeeping Coach Jim McQueen and first team coach Myles Allan will take temporary charge of Berwick Rangers, following the departure of manager Robbie Horn. 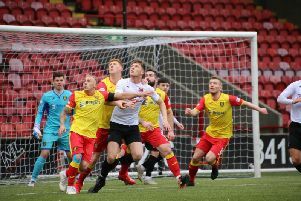 A club statement announced that the pair would be moving up and preparing the squad for their Scottish Cup tie with Gretna 2008, on October 20. The Wee Gers have a weekend free this weekend, due to the Irn-Bru Cup, giving them plenty of time to sort a replacement for Robbie Horn. The next league fixture is on October 27.